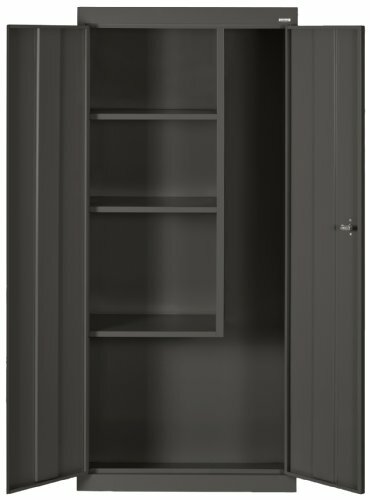 Sandusky Lee VFC1301566-09 is a 25 gauge steel cabinet with three fixed side shelves and an 85 lb. per shelf capacity suitable for the storage of cleaning supplies and equipment. The unit has two hinged doors with full-length stiffeners for strength, and a locking swing handle for security. This supply cabinet has three side shelves on the left that are 18 inches wide to provide space on the right for equipment such as brooms, mops, and vacuums. This unit has a black powder coat finish to resist chipping and corrosion. The assembled cabinet measures 66 x 30 x 15 inches (H x W x D). (H is height, the vertical distance from lowest to highest point; W is width, the horizontal distance from left to right; D is depth, the horizontal distance from front to back.) This supply cabinet ships assembled, but handle assembly is required. Instructions for handle assembly are included, assembly tools are sold separately.